sau 12150 de puncte. Detalii. The purpose for this book is straightforward: to provide an overview of planning principles and the tools used by planners to design campaign plans. Since 9/11, the US military has been involved in numerous actions, most notably in Iraq and Afghanistan. 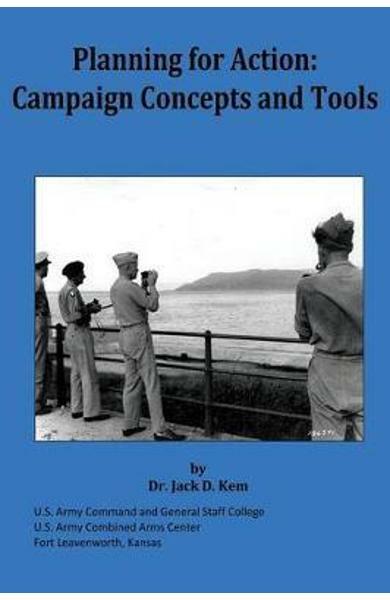 The approach to campaign planning has changed and evolved over this time, spawning a number of new concepts and approaches to planning; this book is intended to provide some assistance in understanding and applying those concepts and approaches. Cartea Planning for Action: Campaign Concepts and Tools - Jack D. Kem face parte din categoria Other areas of law a librariei online Libris.ro si este scrisa de Jack D. Kem.